Go to original pattern for design DROPS 187-5. 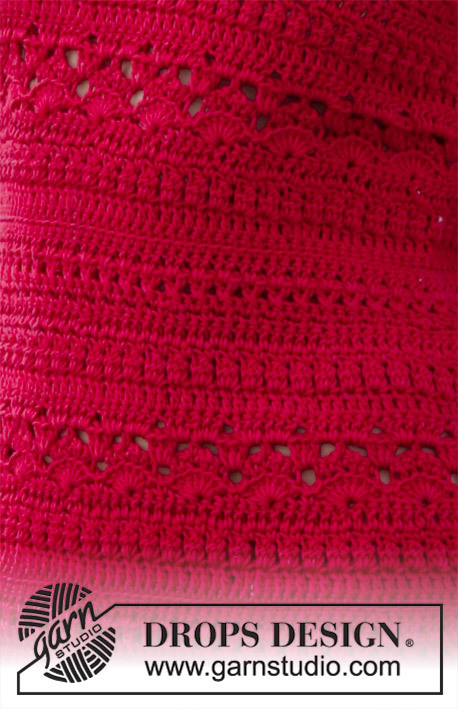 Crocheted dress with texture pattern. Size: S - XXXL Piece is crocheted in DROPS Muskat. 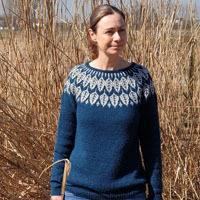 “Alternative yarn (yarn group B)” - see link below. DROPS CROCHET HOOK SIZE 4 mm – or size needed to get 17 treble crochets = width 10 cm. See diagrams A.1, A.2 and A.3. A.2 shows how round begins/ends when working in the round. Work 3 chain stitches at the beginning of rows starting with treble crochets (does not replace first treble crochet). Work 1 chain stitch at the beginning of rows starting with double crochets (Does not replace first double crochet). Work 1 treble crochet in first stitch, but wait with last yarn over and pull through (= 2 loops on hook), work 1 treble crochet in next stitch/around the chain stitch, but on last pull through pull yarn through all 3 loops on hook (= 1 treble crochet decreased). 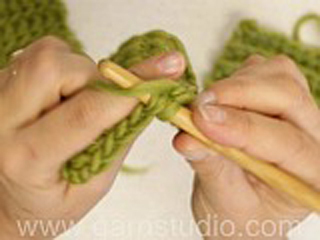 To calculate how to decrease evenly, use the total number of stitches (e.g. 156 stitches) and divide stitches by number of decreases to be done (e.g. 6) = 26. 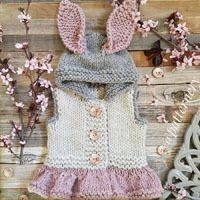 In this example crochet approx. every 25th and 26th stitch together. There is a 10 cm vent at the bottom of dress, first work piece back and forth until vent is done, then work piece in the round but turn on every round and work back on round to make the texture the same all the way. When piece is divided at the armhole, work back and forth again. Work 90-97-104-111-125-139 chain stitches with Muskat on hook size 4 mm. Continue with 1 double crochet in 2nd chain stitch from hook, then 1 double crochet in each of the next 4 chain stitches, * skip 1 chain stitch, 1 double crochet in each of the next 6 chain stitches *, repeat from *-* the entire row = 78-84-90-96-108-120 double crochets (chain stitch to turn with is also counted as 1 double crochet). 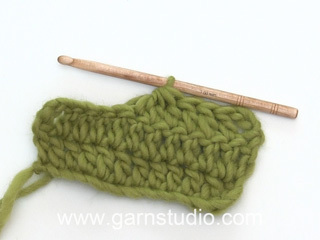 Turn and work 1 double crochet in every double crochet. 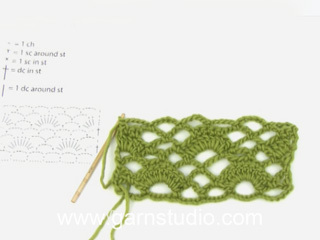 Now work according to diagram A.1 - read CROCHET TIP! REMEMBER THE CROCHET TENSION! After 10 cm put piece aside and work the back piece. Work 90-97-104-111-125-139 chain stitches with Muskat on hook size 4 mm. Continue with 1 double crochet in 2nd chain stitch from hook, then 1 double crochet in each of the next 4 chain stitches, * skip 1 chain stitch, 1 double crochet in each of the next 6 chain stitches *, repeat from *-* the entire row = 78-84-90-96-108-120 double crochets (chain stitch to turn with is also counted as 1 double crochet). 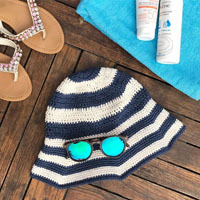 Turn and work 1 double crochet in every double crochet. Now work according to diagram A.1. Continue until piece measures 10 cm - finish on the same row as on front piece. Continue pattern like this - first work stitches over front piece, then work stitch over back piece, then work round together with a slip stitch in 1st/3rd stitch on round, work stitch in A.2, turn piece and work back. Insert 1 marker thread in transitions between front and back piece = sides. Continue like this back and forth with pattern according to diagram A.1 and A.2. On rounds with treble crochets or double crochets there are now 156-168-180-192-216-240 stitches on round (A.2 is not counted in number of stitches). When piece measures approx. 30-31-32-33-34-35 cm - adjust so that next round is a round with treble crochets or double crochets (marked on diagram with star), decrease 6 stitches evenly - read DECREASE TIP and DECREASE TIP (evenly). Repeat decrease 6 times in total on the 6 marked rounds with treble crochets or double crochets = 120-132-144-156-180-204 stitches on a round with treble crochets or double crochets. After last decrease round work pattern as before for approx. 3 cm – adjust so that next round is a round marked with star (piece now measures approx. 48-49-50-51-52-53 cm). Now increase 6 stitches evenly on round by working 2 stitches in 1 stitch. Repeat increase 4 times in total vertically at the rounds marked in diagram = 144-156-168-180-204-228 stitches on a round with treble crochets or double crochets after last increase. When piece measures approx. 60-61-62-63-64-65 cm – adjust after a round marked with star, finish dress according to diagram A.3 (turn as before with diagram A.2). 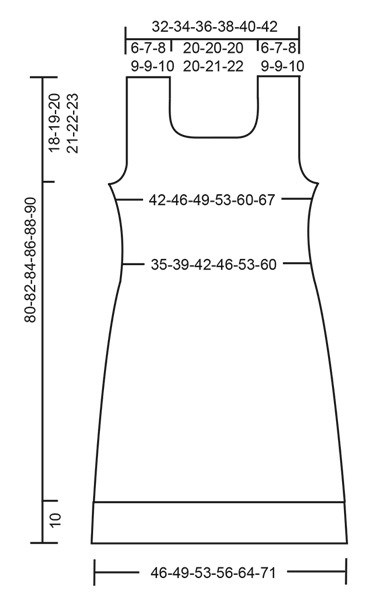 When piece measures 62-63-64-65-66-67 cm, divide the piece for front and back piece at the armholes. Work slip stitches over the first 4-5-4-5-6-7 stitches, then work until 4-5-4-5-6-7 stitches remain before marker thread in the other side, turn piece. On next row work the 4 outermost stitches in each side together 2 by 2 – read DECREASE TIP! Repeat decrease on every row 0-0-1-1-2-3 more times. On next row work the 2 outermost stitches together, repeat decrease on every row 2-2-2-3-4-5 more times. After all decreases are done, 54-58-62-64-68-72 stitches remain on row. When piece measures 70-71-73-74-76-77 cm, finish each shoulder separately. Continue with treble crochets over the first 17-19-21-22-23-24 stitches from the right side of piece, turn and work the first 4 stitches together 2 by 2 for neck, then work the rest of row. Turn and work until 4 stitches remain before neck, work these together 2 by 2, turn. On next row work the first 2 stitches together, then work the rest of row. Turn and work until 2 stitches remain, work these together. Turn, work the first 2 stitches together, work the rest of row = 10-12-14-15-16-17 stitches remain on shoulder. Continue until piece measures 80-82-84-86-88-90 cm, fasten off. Work the other shoulder the same way, but in reverse. I.e. Start from the right side and working the decreases for neck at end of rows from WS. Work slip stitches over the first 4-5-4-5-6-7 stitches, then work until 4-5-4-5-6-7 stitches remain before marker thread in the side, turn piece. On next row work the 4 outermost stitches in each side together 2 by 2 – read DECREASE TIP! Repeat decrease on every row 0-0-1-1-2-3 more times. On next row work the 2 outermost stitches together, repeat decrease on every row 2-2-2-3-4-5 more times. After all decreases are done, 54-58-62-64-68-72 stitches remain on row. Continue to work until piece measures approx. 78-80-82-84-86-88 cm. Then finish each shoulder separately as follows: Work 1 row over the first 12-14-16-17-18-19 stitches, turn, work the first 2 stitches together, work the rest of row. Turn and work until 2 stitches remain, work these together. Turn, work the rest of row, fasten off. Repeat on the other shoulder. Sew shoulder seams edge to edge to avoid a chunky seam. Work a decorating edge around the neck, each armhole and at the bottom of body - as well as up and down each vent. Work decorating edge as follows: 1 double crochet, * 3 chain stitches, 1 treble crochet in 3rd chain stitch from hook, skip approx. 1 cm and make 1 double crochet *. 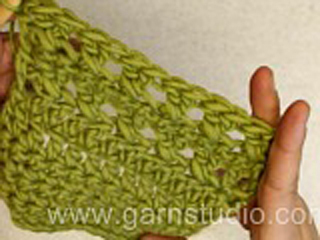 Repeat from *-* and finish with 1 slip stitch in first double crochet from beginning of round. Er is inmiddels een correctie op het patroon gekomen en op de toer met een ster moet je meerderen of minderen. Dit staat aangegeven in de tekst. Hello. I didn't find where it's written that diagram A2 consists of diagrams A2 and A3. Could you please check? Dear Elena, you will find A.3 on the right side of the diagram A.1 and A.2, ie A.3 = 6 last rows in both diagrams. Happy crocheting! Do you increase in the vent? Dear Carroline, there is no increase in the went, just crochet according to pattern A.1. Happy Crafting! Would it be easy to extend so can have a longer length? Approx mid calf length. Dear Mrs Taylor, you could probably work the extended part "straight" ie without decreases and continue as explained in the pattern, add the extra length to the measurements given in the pattern. For any further individual assistance please contact the store where you bought the yarn, even per mail or telephone. Happy crocheting! Hello I am interested in purchasing yarn. I know you probably have no way of knowing exactly when I will be receiving the yarn but I would need the yarn so I can make the Belladonna dress in time for Christmas. Will it take longer than a week? Thank you in advance. Dear Mrs Cabera, please contact individually each DROPS store shipping to the USA to get further informations about shipment delay. Happy crocheting! What difficulty level is this pattern? Also, is the yarn supposed to sport weight, or worsted..? Dear Heather, we do not have any difficulty level to our patterns, since this vary from country to country. Just read thouroughly the pattern - you are welcome to ask your questions here or contact your DROPS store for any individual assistance. You'll read more about the yarn under its shadecard. Happy crocheting! Hello Sahar. You increase 6 sts on each row. Happy crocheting! Virkad både A1 och A3 upp till 60-65 cm? Liebe Frau Paditz, Die Übersetzung für die Häkelschrift ist korrekt, sollten Sie eine Frage haben, dürfen Sie sie hier gerne stellen. Ihr DROPS Laden kann auch Ihnen entweder per Mail oder telefonisch weiterhelfen. Viel Spaß beim häkeln!